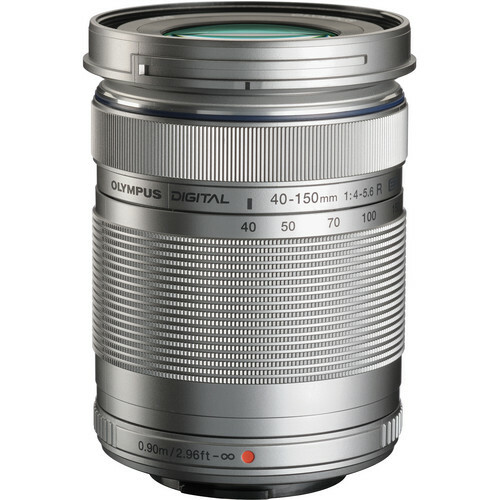 The Olympus M.Zuiko Digital ED 40-150mm f/4.0-5.6 R Lens is a high-performance digital-specific 3.75x telephoto zoom lens with a 35 mm equivalent focal length of 80-300 mm. A light, compact, and fast focusing lens that's ideal for portraits and other subjects in the middle and far distance, the 40-150 mm has nearly silent focusing technology that makes it a perfect choice for recording HD movies with excellent sound. The Micro Four Thirds format brings portability and great optical performance that can capture spontaneous, high-quality photos and movies. Special optical glass elements are used to correct various types of aberrations, while the 100% digital design ensures high-definition performance with clear, crisp images from edge to edge. This lens also boasts impressive close-up shooting capability, allowing users to shoot from as close as 2.9' (0.9 m) throughout the entire zoom range. The focusing ring has an improved texture for a sure grip. Olympus' near-silent focusing technology ensures the new lens can record HD movies with excellent sound, eliminating the whir that can otherwise ruin movie playback. A light, compact and extremely fast-to-focus lens--perfect for shooting portraits or other subjects in the middle distance.